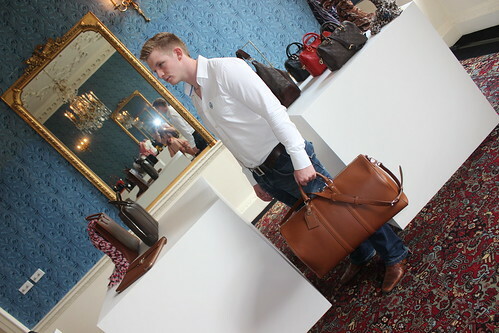 This week I was given the great honour of being invited to preview the Louis Vuitton Autum/Winter 2012 collection. There is only one word that I can use to describe the new releases and that word is… WOW! 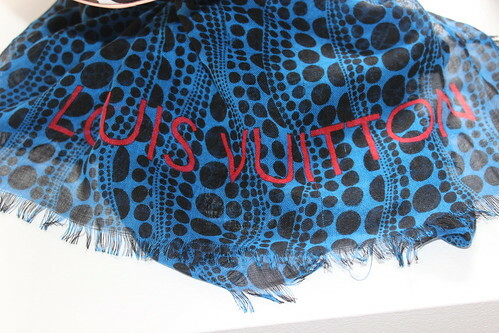 Until now, no Louis Vuitton range could top the Stephen Sprouse “Grafitti” for me… however the bags that I saw on display were equally as stunning and some spectacularly so. 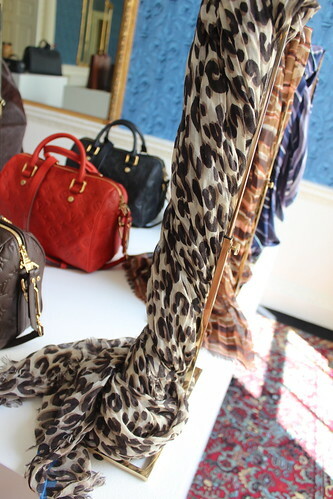 From Polka Dots to Goats hair and Rainbows to Leopard print, this collection has it all and so much more besides! 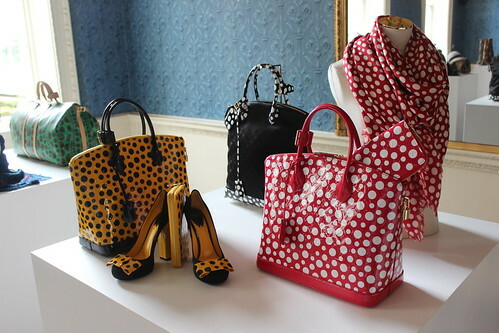 My personal favourites would have to be the Leopard Print “Speedy”, the Purple Sequined “North-South” and the green “Keepall” from the Kusama “Pumpkins and Waves” collection. Although if given the choice I would give each and every piece a very good home! The Men’s line was every bit as exciting with its strong silhouettes and vibrant tones. I could see my Boyfriend making mental notes of his favourite items as we perused table after table of absolute luxury. If, like me, you were amazed by Louis Vuitton’s breath-taking fashion show, where a vintage steam train carrying the models appeared on the Catwalk, you can imagine my sheer excitement at getting an up close and personal view of each of the items from the show before they go on sale. The photographs really do speak for themselves. 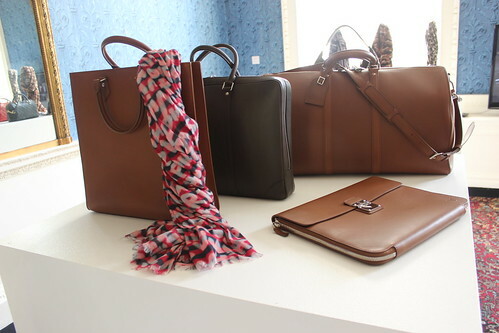 Every item exudes the typical Louis Vuitton elegance whilst tapping into a whole new realm of colours and styles. If an image is worth a thousand words then Ladies and Gentlemen this post could fill a library! I would like to say a huge thank you on behalf of myself and my followers to Tom Meggle, (Managing Director of Louis Vuitton UK and Ireland) and Anna Reiter (Digital Marketing Officer) for the wonderful invitation! I hope you, my readers love the collection as much as I did. Please let me know which are your favourites and don’t forget to keep reading for details of each range. 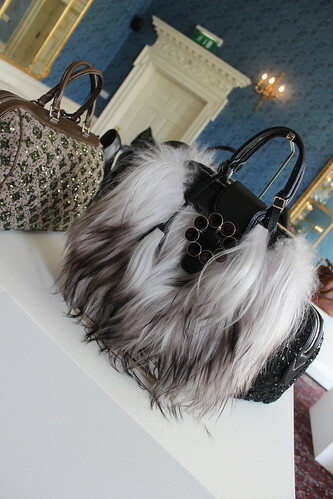 The Wooly Paillettes collection is made up of three key pieces, the “Speedy” and the “North-South” as shown in the pictures and the “Baby” which is the perfect evening bag. The sequins are stitched onto wool and the monogram design is faintly visible through the glistening beauty. 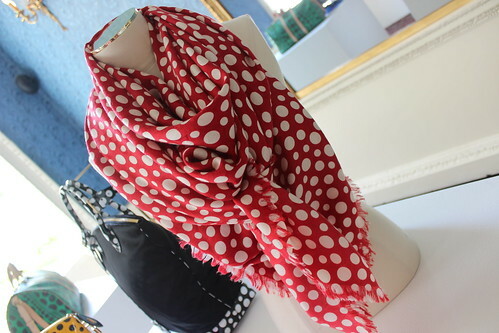 The “Infinitely Kusama” collection is a result of a genius collaboration between Marc Jacobs, Creative Director for Louis Vuitton and Yayoi Kusama, an 83 year old designer with a penchant for Polka Dots. 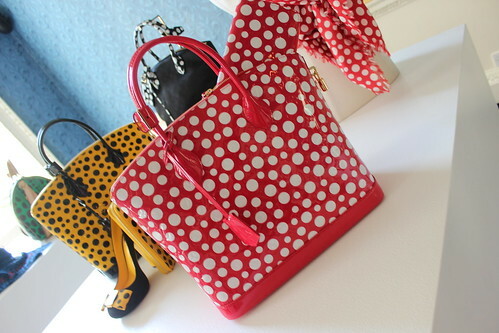 This quirky collection incorporates clothing, trench-coats, jewellery, footwear, scarves and of course handbags, each of the items engulfed by thousands of dots in bright quirky colours. A collection for the confident fashionista who is not afraid to stand out from the crowd. “Pumpkins and Waves” is the second collection from the Kusama range. This time the iconic “Speedys, Keepall’s, Neverfulls and Papillons” shall get a makeover courtesy of Yayoi Kusama’s creative touch. This collection, again dotty by nature comes with a twist… Released exclusively to Selfridges on August 24th and everywhere else in early October, this eye-catching collection is certainly one worth waiting for! The Transsibérien collection was again inspired by travel, this time taking its name from the Transsibérien Railway that linked Moscow with the Russian Far East and the sea of Japan. The beautiful dip-dyed Goats hair transforms this square bag into the most eye-catching arm-candy I have ever laid eyes on. Swarovski Crystals complete this stunning creation and make it a must for any Winter wardrobe. The Louis Vuitton Empreinte range is an understated classic. 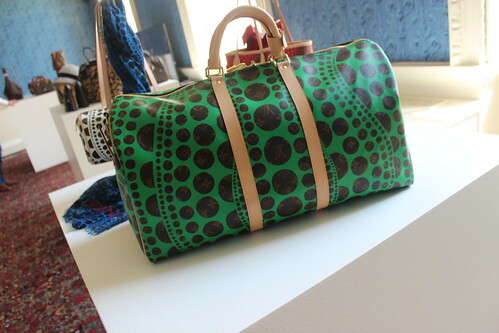 The smaller sized Speedy, as seen here was originally designed for Audrey Hepburn as she wanted to have a small piece of luggage that she could carry on board a Train or Plane for all her valuable possessions. The classic brown and black colours are ideal to match an entire wardrobe whilst the splash of colour with the coral is an ideal statement piece to make you stand out on the Platform of any train station. The Autumn/Winter Shoe collection brought back the square toe and the block heel. With strong buckles and a mix of colours and leathers there is a shoe to suit every style and personality. As this season was predominantly based on travel, the shoe line conveys a sense of comfort, something one could wear whilst running for a train and still look dressy and elegant with the skyscraper heel. Anna Reiter and Myself at the A/W’12 preview! 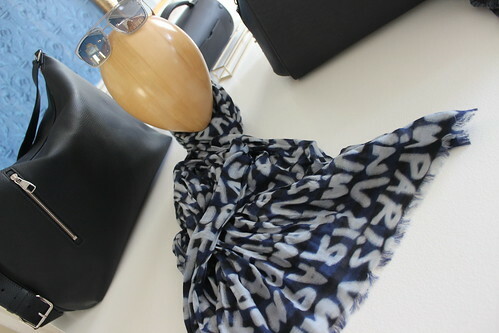 Zebra print was first seen at the Louis Vuitton S/S’11 show and is fast becoming a staple of the brand. 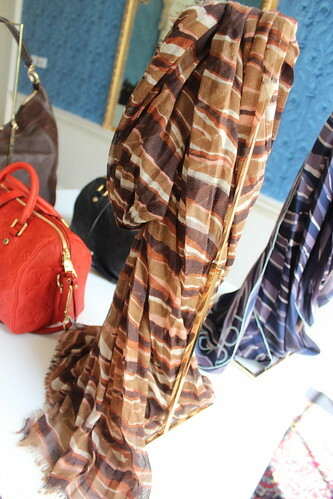 These new cashmere and silk Stoles are the perfect accessory to dress up any outfit, or handbag for that matter. The classic colours are timeless and versatile making sure that an investment in these beauties will be for life, not just for this season! This speedy is from “The Golden Arrow Collection”. Inspired by travel, this range was named after the luxurious 1920’s boat train, which linked London with Dover where passengers then took a ferry to Calais. A nod to Louis Vuitton’s French roots. Trimmed in leather and vintage hardware, this piece is a timeless classic. The Autumn/Winter Menwear collection debuts Kim Jones second season designing for the French Fashion house. 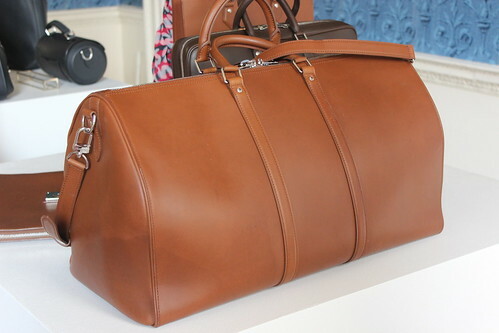 His love of travel coincides perfectly with the original ethic of Louis Vuitton, with his key pieces aimed at the Travelling Gentleman. 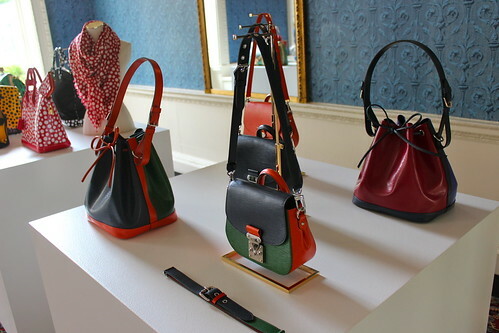 The strong chic shapes and bold masculine colours make the collection unique and eye-catching! 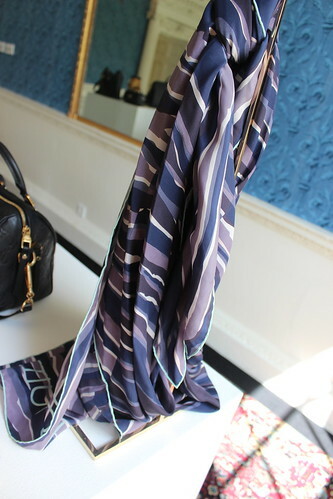 I love these scarves and would even wear them myself, regardless of them being part of the menswear line.